Chrystia Freeland has been a fixture in the U.S. capital in recent weeks. OTTAWA — Foreign Affairs Minister Chrystia Freeland ventured Wednesday onto Donald Trump's home turf, denouncing his "absurd" tariffs and forcefully arguing for preservation of the world's rules-based order _ with or without the United States. The minister stayed above the fray on those attacks, but she did not hesitate to repeat Canada's opposition to the tariffs in the bluntest of terms _ in particular the use of Section 232 of U.S. trade law to justify the action on national security grounds. Later Wednesday evening during a major foreign policy speech, Canada's top diplomat broadened her focus with a sweeping defence of something Trump has little time for _ the international rules-based system that the U.S. led in creating after the Second World War. 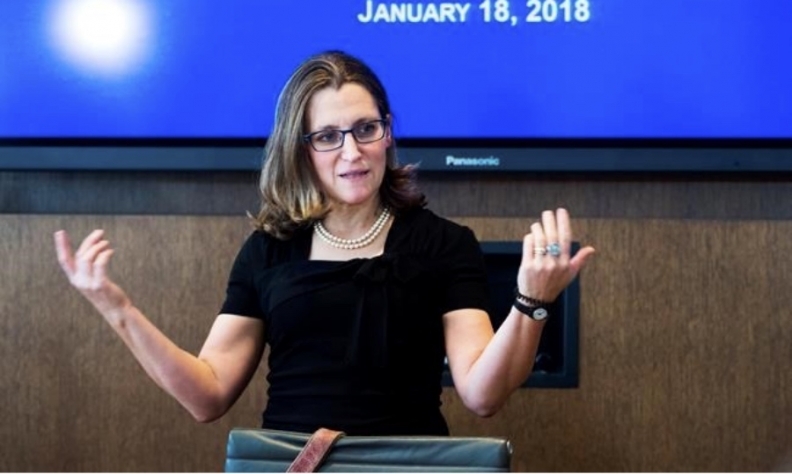 "We see this most plainly in the U.S. administration's tariffs on Canadian steel and aluminum," Freeland said in her acceptance speech for winning the Foreign Policy journal's diplomat of the year award. "We all know we will be strongest with America in our ranks _ and indeed in the lead," she said. "But whatever this great country's choice will turn out to be _ let me be clear that Canada knows where it stands." But she evoked the great Republicans who came before him _ from Abraham Lincoln's Gettysburg's Address to Ronald Reagan's 1989 "City on the Hill" farewell speech where he envisioned a country "built on rocks stronger than oceans, wind-swept, God-blessed, and teeming with people of all kinds living in harmony and peace." "The Section 232 action _ which is, let me remind people, a national security consideration _ is frankly absurd," Freeland said on Capitol Hill after the meeting. Earlier, Public Safety Minister Ralph Goodale told the Fox News business show "Varney ? Co." that despite the dispute over the tariffs Canada still wants to make a deal to resolve the renegotiation of the North American Free Trade Agreement.